Sandia National Laboratories is one of the largest National Labs in the United States. They’ve teamed up with USSOCOM to develop a bleeding edge rifle scope for the modern era. The wars in the Middle East have launched a new age of weapons and war fighter technology development. No longer are wars fought strictly in large urban environments or dense jungles. The need for a soldier to engage a target 25 meters within a village and rapidly transition to engaging a target at 300 meters has become the norm. Variable zoom rifles scopes initially filled this role, but the need for a faster transition has fueled the research and development for the RAZAR. 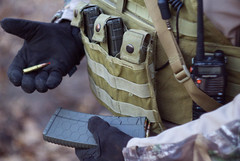 With the push of a button the user can switch between multiple zoom distances, allowing them to engage a target inside, move to a roof, and engage a target on an opposite ridge with little down time. Sandia has developed a scope that utilizes the concept behind the way our eyes focus on objects, using a polymer membrane to create an instant variable zoom capable rifle at the push of a button. By changing the focal length of the polymer within the scope, a variety of zoom levels can be achieved. The fact that this can be done in the matter of a second certainly makes this piece of hardware a force multiplier for our units. Next story The Right to Bear Arms: The History, and Why It’s Necessary.